Hi all I hope you're well. I've been having so much fun at my resent class with the lovely Stampin' Up! Stamp sets Bear Hugs and Bloomin' Love. All the ladies that came enjoyed making these cards, don't you think they look great? Would you like to come along and make fab cards? 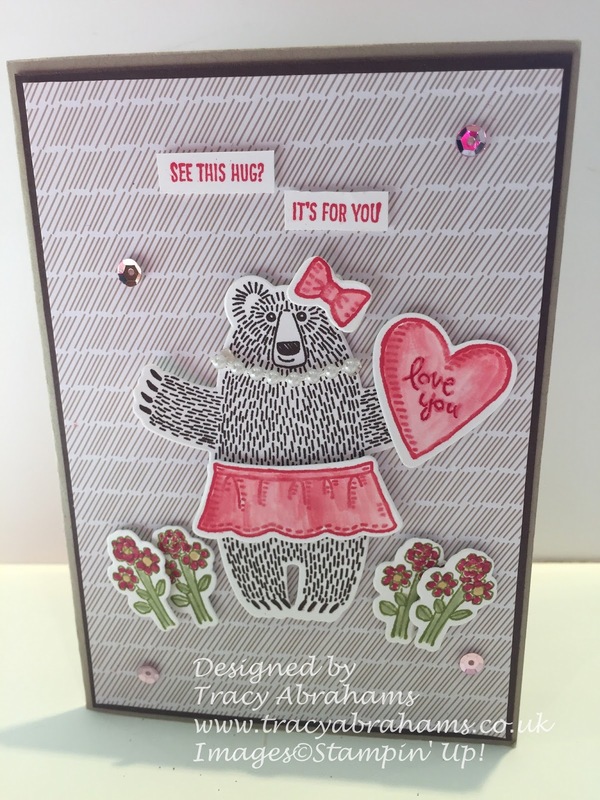 The Bear Hugs Stamp set is such a versatile stamp set and as you can see we used it for not only a Valentines card but a super cute baby card as well, with a little tag that come out the top of the card. The lovely Bloomin' Love Thinlits was a great hit with the ladies as it makes a beautiful die-cut heart sharp and looked so good in the Blushing Bride Glitter Paper. 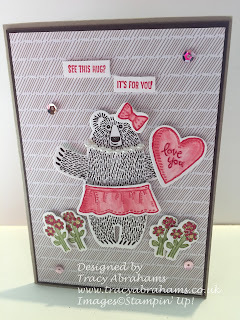 We added some details from the stamp set and embellishments from the Love Blossoms Embellishment Kit and it looked so good. I will add all the goodies we used below and if you would like to make similar cards get yourselves these great bundles. Remember is you spend £45 or more you will receive a Sale-A-Bration Items, and there's so many lovely things to choose from. If you make a purchase please use my hostess code RHA7W9H4 and I will send you out a gift straight from me at the end of the month. Please tick the I would like contact section, it means i know where to send the gift to. Stampin' Up! will not contact you only me and only I have your address, and i so love to send Stampin' Up! goodies to people.